This article aims at telling you the main reasons and converter tools to convert VOB to AVI for Mac users. Versioned Object Base or commonly termed as VOB is a centralized database that can store version information of folders and files within a Software Configuration System (SCM). This term is normally related to ClearCase, which is known to be a distributed program established by Rational Software designed to be used in server or client environments. VOB has current source file versions and detailed history of usage and updates of files. This history involves dates of usage, version numbers and all information about the one who created every version. There is also included information on derived objects. Complicated VOBs can be displayed graphically as a source tree file-system. Using large VOBs is memory intensive. Performance also depends on the write or read speed of hard drives where programs are installed. On the other hand, AVI or what we call Audio Video Interleave is a container format for multimedia which was introduced in November 1992 by Microsoft as a part of their video technology for Windows. AVI files contain video and audio data in its file container which allows the synchronous playback of video with audio. Some AVI features like multiple streaming of video and audio are not used too often but AVI files are also supporting these features in DVD video formats. Recent AVI files may be compressed with codecs like XviD and DivX which can be seen on VLC Player, KMPlayer and MPlayer. AVI files can also be created without compression, which mainly results to extremely huge file sizes. These large files don’t lose quality obtained from input video to saved files. There are no codecs that need installation either for playback or saving. These file formats provide special purposes that are dependent to your file formatting needs. The suitability of these file formats depends mainly on your specific requirements. Having the idea of the difference of a VOB to AVI is important for you to determine your formatting needs especially if you’re planning to convert file formats. VOB works better for you if you’re into information storage of your folders and files but if you need a file container that can hold large files for you with no compression, especially video and audio files, you definitely need to convert your VOB files into AVI for a more convenient way of streaming of videos and audios on your Mac. Step 1 You should have a Mac version of a VOB to AVI converter on your desktop like Wondershare UniConverter for Mac (originally Wondershare Video Converter Ultimate for Mac) and install it on your Mac desktop. Launch the Wondershare UniConverter (originally Wondershare Video Converter Ultimate) so you can start converting your video files. Step 2 Click “Add File” on the main interface to start importing the VOB file to the program. Step 3 Select the output format as “AVI” located on the output folder and click “Convert” to proceed. Step 1 Your VOB should be ready for your online converter upload. Click “Choose File” on the interface or you can also enter the video’s URL. Step 2 Choose the output format of your VOB file to “AVI”. There are options for available for you if you would like to change audio quality, screen size, frame rate and video bitrate, rotate or flip video and cut video. Click convert. Step 3 Wait for the conversion to be completed and download the converted AVI file. 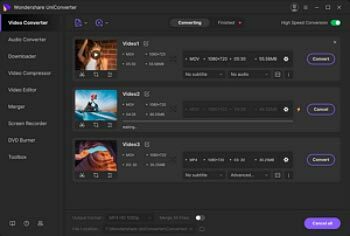 AVI converters allows various conversions on different source formats like MP4 to AVI, YouTube to AVI, M2TS/MTS to AVI and MKV to AVI for better video compatibility.